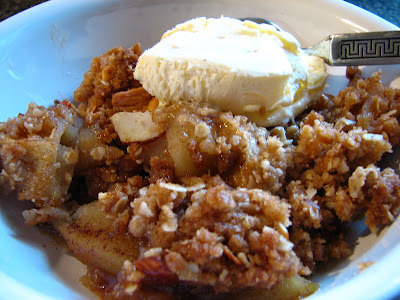 I love the aroma of apples and cinnamon cooking together; it excites the senses as it permeates my home and brings back memories memories of my Mother, baking "Apple Crisp" when I was young. Apple desserts rate right up there with chocolate as my favorite sweets! I have been trying to come up with a recipe that has a good apple to crust ratio, apples that aren't too sugary, and a crust that is, of course, crisp! So this is the result of trying different recipes through the years and finally coming up with this one on my own. Be sure to use a firm, tart apple. Don't over bake the crisp or it will be dry and maybe burn, especially the nuts. This recipe fills a 9x13 pan when assembled, but will ,of course, cook down during baking. 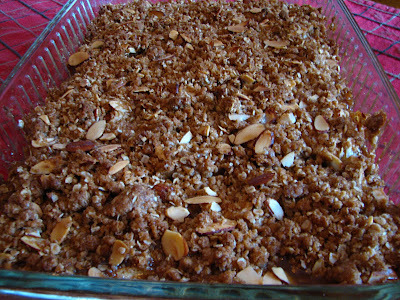 Enjoy my "Apple Crisp"! Mix above ingredients together and place in a greased 9x13 baking dish. With a pastry blender work the topping until it is crumbly. Add 1/2 cup of sliced almonds or chopped pecans to the topping and work the nuts in with your fingers until you have a fine crumb. Sprinkled evenly over the apples. Bake in a preheated 375 degree for 35-40 min. until brown. A toothpick inserted in the apples will tell you how done the apples are. Remove from the oven, let cool if you want . It's best served warm with whipped cream or ice cream, of course!